Livestock guardian dogs are an ancient solution to a problem that still plagues livestock owners around the world: protecting livestock from predation. Small animals like chickens seem to be on everyone's menu. Medium-sized animals like sheep and goats can be chased down and killed by larger predators such as coyote, big cats and bears, as well as otherwise friendly neighborhood dogs. Large livestock such as cows and horses may not seem at risk, but coyotes can take calves and foals, and can chase down adults until they are too tired to fight off a determined attack. Whether you live in near-urban areas, suburban neighborhoods, or out in the country, your livestock are on the list for a surprisingly long list of nearby predators. Just because you don't see them doesn't mean they aren't there. Livestock guardian dogs can help make sure those predators don't dine at your table. When we first got livestock, we figured good fencing and hotwire would suffice to keep them in and keep predators out. For the first few years, it did. We had zero predator losses the first four years we had goats and chickens. But then a variety of predators started taking chickens, one at a time. We'd find one unbelievably narrow opening in a fence, patch that up, then the predators would find three more. Since we had begun breeding our goats by then, and we had young goat kids on the property, we knew we had to do something before the losses got worse. We considered our reasonable options. Shooting the predators was suggested by many, but it was impractical. The predators tended to wait until we were gone before they'd strike, since we would always respond if predators came around while we were home. Trapping the predators was unaccepable. We had no interest in the inhumane leg traps for larger predators, and we had already learned that smaller predators would too quickly figure out the traps and go around them. Poison was out of the question since we had a lot of wildlife we didn't want to harm, not to mention our own animals. Then during one predation attempt, our house dog tore after the predators trying to steal more chickens, and chased them off the property before we could even put our shoes on. We knew we had our answer. Since 2005, we've added four livestock guardian dogs to our farm, and our predator losses have dropped to zero. Two of our dogs guard the poultry and small animals. The other two dogs guard our sheep and goats, and keep an eye on the horses and cows. Our lives have changed dramatically as a result of those additions, in some wonderful and not-so-wonderful ways. Still, knowing what we know now, we will never be without livestock guardian dogs again. Life with livestock guardian dogs can change your entire household, but for us, it's been worth it. This section of the website is dedicated to these amazing dogs. Here we'll talk about the breeds doing this work (and what makes them different from other dogs), the principles behind dogs guarding livestock, the methods involved with using livestock guardian dogs, and the reality of having these dogs on the farm. It can be a win-win for everyone. It has been a win-win for us. But that is not a guaranteed outcome, and we've heard some very sad stories from those who rushed in or didn't adequately prepare for what a life with these big dogs can mean. We strongly encourage anyone interested in using this approach to do a lot of planning and preparation first, and to proceed carefully. There are a lot of wonderful dogs out there, and they deserve to be in homes that are well geared for their work, their preferences and their needs. We hope these pages will help in that regard. These magnificent dogs deserve no less. We get a lot of questions about livestock guardian dogs. At first we tried to answer those questions one at a time, each time the questions came up. But over time we saw the same questions being asked, over and over again. So we have compiled a list of those most common questions, along with the answers we've come up with. We have also shared observations and practices with enough other LGD owners, that we have compiled a list of recommendations that have worked reliably for other owners. 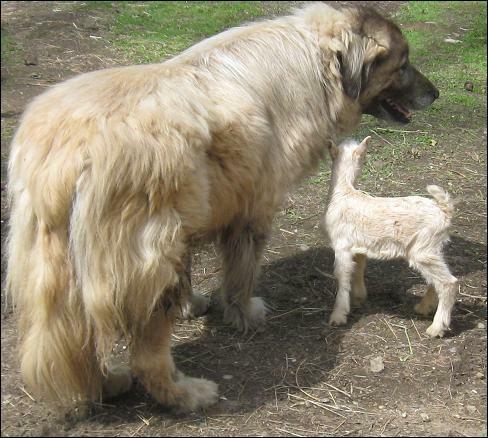 We offer those questions and answers on our Livestock Guardian Dogs Guide page. If you are considering acquiring one of these dogs, or you are having some issues with an LGD, we encourage you to look through that page for more information. If your questions are not answered there, please contact usand we will not only research the problem, but we will share whatever we learn in the process. As we continue to build out our website, we will be adding more pages about our dogs. If you have questions, please contact us. We'll do our best to either answer your question directly, or post that particular topic sooner than we may have otherwise planned. We hope you'll come back often to check on our progress. We can honestly say that our dogs have made a huge difference not only for our livestock's safety, but also for our own quality of life. We look forward to sharing that experience.